Review by AllTheBestFights.com: 2018-02-03, good pace with some nice exchanges: Omar Narvaez vs Jesus Vargas 2 gets three stars. The former world champion in two different weight classes Omar Andres Narvaez entered this fight with a professional boxing record of 47-2-2 (25 knockouts) and he is ranked as the No.6 bantamweight in the world (currently the #1 in this division is Luis Nery). ‘El Huracan’ Narvaez suffered his last loss when he faced Naoya Inoue in 2014 (=Narvaez vs Inoue), since then he has won four bouts beating Nikolai Potapov in 2017 (=Narvaez vs Potapov). His opponent, Jesus Vargas, has an official record of 16-11-1 (12 KOs=75%) but he won just two out of his last ten fights. He had already faced Narvaez in 2016 losing in seven rounds (=Narvaez vs Vargas I). 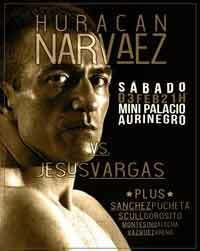 Narvaez vs Vargas 2 is the main event of the evening. Watch the video and rate this fight!